Having a smoothie in the morning, is an easy way start and stay in a balanced blood sugar state. But it’s essential that it contains enough protein, fat and fiber to keep you full. This will make you feel satiated and go into lunch balanced. When making your morning smoothie, it’s not enough that it’s pretty and fruity- Make sure it ticks all the nutritional boxes. 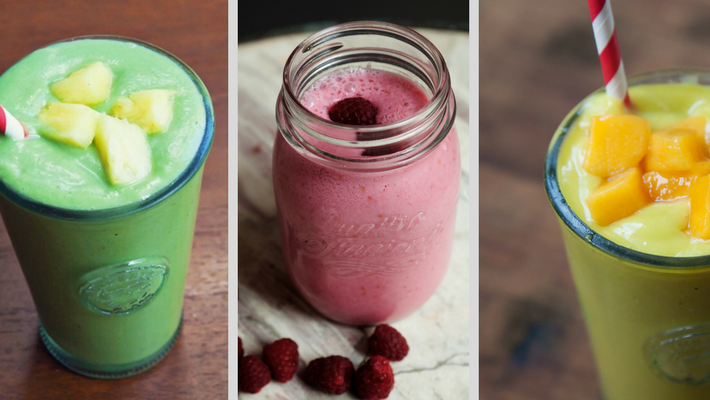 A simple, nutrient dense, easy to digest smoothie starts off with a good base base. Ensure you have a good quality protein. I prefer protein powder, but you can also use use yogurt or kefir. (If your body does well with dairy). Avoid large quantities of sugar, specifically fructose sugar from excess fruit. Keep fruit to one serving. Throw in some healthy fats to keep you full and satisfied. Coconut oil, nut butters, flax oil, and MCT oil are all great to add in a smoothie. To build upon with other ingredients. Add your mix-ins or boosters- more fiber (chia or flax seeds), greens, spirulina, turmeric, cacao, bee pollen, maca etc. For smoothie and smoothie bowl recipes, click here for a bunch!